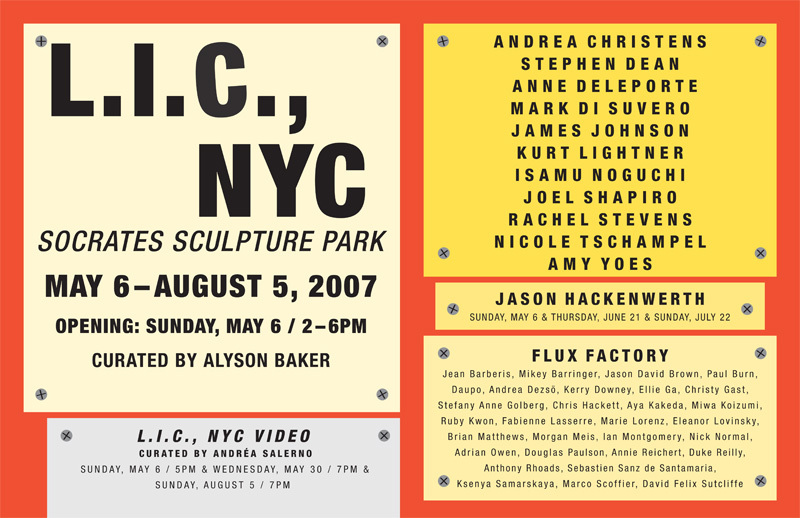 Socrates Sculpture Park is pleased to announce the opening of L.I.C, NYC, an exhibition of artists working in Long Island City, Queens. Presented as part of the Park’s 20th anniversary year, the exhibition highlights and celebrates the area’s remarkable creative community, featuring works from a broad spectrum of generations and mediums. L.I.C., NYC includes the participation of Flux Factory, a Long Island City-based collaborative with artists: Jean Barberis, Mikey Barringer, Jason David Brown, Paul Burn, Daupo, Andrea Dezsa, Kerry Downey, Ellie Ga, Christy Gast, Stefany Anne Golberg, Chris Hackett, Aya Kakeda, Miwa Koizumi, Ruby Kwon, Fabienne Lasserre, Marie Lorenz, Eleanor Lovinsky, Brian Matthews, Morgan Meis, Ian Montgomery, Nick Normal, Adrian Owen, Douglas Paulson, Annie Reichert, Duke Reilly, Anthony Rhoads, Sebastien Sanz de Santamaria, Ksenya Samarskaya, Marco Scoffier, and David Felix Sutcliffe. L.I.C., NYC also includes a video component, L.I.C., NYC VIDEO, a three-part series curated by Andra Salerno. Socrates will host three different screenings during the course of the exhibition on Sunday, May 6, at 5pm; Wednesday, May 30, at 7pm; and Sunday August 5, at 7pm. Jason Hackenwerth uses balloons to create sculptures that are both intricate and monumental in scale. Because of the ephemeral nature of his works, Hackenwerth will design three pieces for L.I.C., NYC that will be viewable in the Park for a limited period after their construction. The first piece will debut on Sunday, May 6, 2007 in conjunction with the L.I.C., NYC exhibition opening; the second piece will premiere on Thursday, June 21 in conjunction with Socrates’ annual Summer Solstice Celebration; and the third piece will be presented on Sunday, July 22. Additionally, The Noguchi Museum will present a panel discussionon May 13, 2007 in conjunction with L.I.C., NYC, titled Long Island City: Sculptural (re)Generations. Presented as part of the Museum’s monthly series, Second Sundays: Dialogues on Art, Architecture, and Design, Long Island City: Sculptural (re)Generations will gather contemporary Long Island City sculptors to discuss their experiences creating in this unique artists’ community and how artists were the catalyst for the development of LIC as a cultural destination. Second Sundays are held at The Noguchi Museum on the second Sunday of each month at 3:00pm and are free with The Noguchi Museum admission. For more information visit http://www.noguchi.org/public_programs.html.